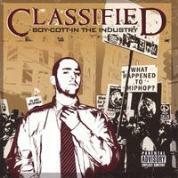 RapReviews.com Feature for May 31, 2005 - Classified's "Boy-Cott-In the Industry"
Rather than front like I knew anything about Classified before this release by spitting out the requisite background info I'll get straight to the point, Classified's "Boy-Cott-In The Industry" both surprised and impressed this reviewer. To clarify, I wasn't surprised and impressed because this dope album was made by a white guy from Halifax, Canada, though Classified is just that. What impressed me is that such a dope album has come and gone with little to no fanfare in the "industry." When I say the "industry" I of course am referring to the good ole American rap game, the measuring stick to the world when it comes to Hip-Hop. Not to slight Canada's music industry or Classified's relatively strong sales according to Canada's version of BillBoard, but despite any success there Classified is still basically unknown in the rap game. Why Classified is unknown has more to do with his frigid surroundings than his skin tone, as American rap fans have been unwilling to accept rap north of the Great Lakes. Even Kardinal Offishall's catchy rap/reggae blend failed to catch fire at the height of the dancehall reggae craze. It really is a shame, but fans lucky enough to catch a listen will be rewarded by Classified's introspective rhymes, on-point delivery, and bumping beats. The title of this CD, "Boy-Cott-In the Industry," reflects the tone of the CD perfectly as Classified shares both his disgust with the current trends in mainstream Hip-Hop and the fact that despite his problems with and in the industry he can't leave the rap game alone. "It's Just My Opinion" starts things off right with a tight brass and string based beat and Classified basically telling critics and fans alike that no matter what people say or think he'll always stick to his guns and they should do the same. "Listen" is a catchy track, with a plucked guitar loop and electric guitar hook. Though the subject matter isn't exactly dance-floor material, the beat could definitely get the crowd moving. "No Mistakes" is a mellow track that finds Classified reflecting on his mistakes during his music career and dropping knowledge so others won't follow suit. Either way it goes I'm still reppin for my coast man"
Of course the album doesn't trail off as it goes along as Royce Da 5'9'' and Choclair show up for "Unexplainable Hunger" and both tear the mic a new one. "F.A.D.S." is another tight track addressing Hip-Hop's obsession with fads and the problems keeping up with the joneses creates. "Sibling Rivalry" is another interesting track which finds Classified arguing through rhyme with Mic Boyd over who's better, both emcees make compelling arguments and the track ends up a dope, yet playful, battle. The album ends with "What's Real" and this time around Classified actually succumbs to a fad himself, flipping a sped up sample for the beat. The result is a heartfelt track addressing those Classified has neglected during his rap career. Classified's "Boy-Cott-In The Industry" may not be a groundbreaking album, it may not contain any radio singles, and it may not get much play in the lower 48 states, but anyone who does tune in will be treated to a dope album from a great emcee/producer. Classified's approach on the beats isn't new or highly complex, but he has a knack for coming up with catchy and head-nodding music track after track. On the mic Classified doesn't have the illest metaphors, and he'll even admit it, but for whatever he may lack in other areas he makes up with sincerity and honesty. Combined, Classified's dual skills produce music good enough to make any Hip-hop fan want to grab a picket sign and join the boycott.